Whether creating your own personal spa area or just updating for resale WBO Builders offers full-service bathroom remodel. Our company has been in the industry for many years now. No matter how big the scale of your renovation project, you can be sure that our friendly and highly skilled renovation professionals know how to get the job done. Your bathroom doesn’t need to look outdated or drab! 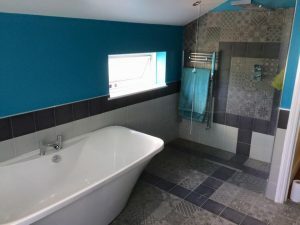 We can offer you some ideas regarding colour schemes and tiling to completely change the look of your bathroom space, always respecting the constraints of your budget. How the bathroom renovations service works? 1. Contact us – Use our online booking form to set an appointment for a survey of your bathroom. 2. Survey – We will send a specialist who will personally take a look at your bathroom. This will help us meet your exact requirements. 3. Quote – Within a period of 7 work days we will be able to give you a final quote for the whole project. 4. Let’s get to work! – The bathroom builders will come to your place whenever it is convenient for you to carry out the service. They will bring all necessary tools, equipment, and materials. 5. Enjoy your newly fitted bathroom! – When the project is finished, the tradesmen will be happy to let you evaluate all the work. What the bathroom renovations services in London include?